With the winter season upon us, the question of how to protect your instrument from damaging adverse climatic conditions is a topic often discussed. In forty plus years that I have been involved in my profession, this winter season has proven to be one of the most difficult for vintage and contemporary basses I have ever encountered. My observation is based upon an extremely high incidence of damages occurring in the form of simple seam openings to top table saddle cracks and extensive top sound post area cracks. Such damages have not been partial to newer instruments, but have been non-discriminatory towards affecting older quality basses as well. What makes this situation more perplexing is that so many of these older instruments have not displayed any form of damages in years past. Why this unusual condition? A combination of harsh environmental conditions and innocent negligence on the part of the player by not taking proper precautions to counter these adverse conditions can cause these conditions to surface. 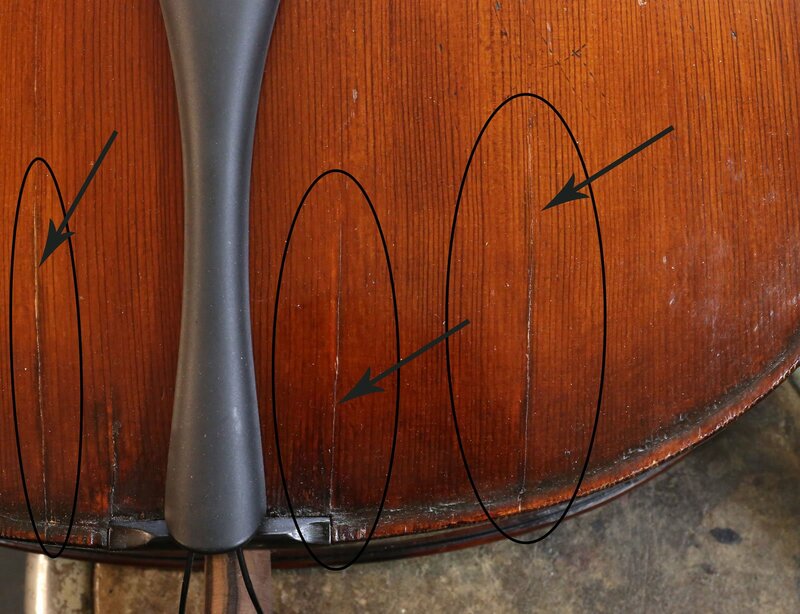 Humidity and temperature and general, radical climatic changes are the most detrimental factors that can potentially cause damage to ones instrument. The subject of radical change and exposure to extreme temperatures is an easy topic to discuss with regards to finding effective means of correcting negative situations. One should always avoid exposing their instrument to the potentially damaging situation of extreme temperatures. Leaving the instrument in an unheated area in the winter or an un-tempered area in the summer is potentially damaging scenarios which need to be avoided. Even on a beautiful spring day with pleasant temperatures, a locked car can expose a Bass to high temperatures that could possibility damage that instrument. Keep in mind, good quality instruments are constructed with the use of water soluble glues that soften and loosen their tensile strength when exposed to heat. Thus, the ungluing of a bass bar, seam opening, ungluing of a crossbar (on a flatback designed bass), and the opening of a previously repaired crack could logically occur. In the case of exposure to a colder, dryer environment, even in older, seasoned instruments, similar types of damages can occur as a result of the expansion and contraction of woods and the drying out of the water soluble glue. The key is to avoid extreme temperatures for prolonged periods of time. A good padded bass cover can afford your instrument what is termed, a thermal dissipation. This is the gradual cooling and heating up of the Bass so as to temper the effects of radical temperatures that a Bass can be exposed to when leaving a heated environment and entering a colder temperature, or vice versa. The area of humidity control is a bit more complex and can be approached in several manners. The pros and cons of humidification and the available devices for humidification should be addressed. Extended cold and dry environmental conditions, as well as hot humid conditions can pose future damage to an instrument. Temperatures do not have to be extreme for the percentage of humidity to drop to an insufficient level which could possibly affect the structural integrity of your instrument. In fact, a good rule of thumb is that when the heat is turned on in winter, so should an automatic regime of humidification be turned on and this schedule should be adhered to until the winter heating season ends and the warmer spring and summer weather prevails. 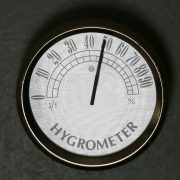 A great preventive measure is to monitor environmental conditions of humidity by the utilization of a hygrometer. This fairly inexpensive device is a good indication of the percentage of humidity in the space where the bass will be stored. I recommend as a guideline, maintaining healthy humidity levels of a minimum of fifty percent (50%) or better. I am often asked, is too much humidity a problem? My stock answer is: “well, do not let moss grow on the walls.” Forty five to fifty five percent is ideal and a room humidifier should handle that nicely. What about the utilizing of an internal humidifying device that is dampened and placed within the Bass? Frankly, I was one of the largest dealers handling several of these devices, but no longer advocate them for several reasons. 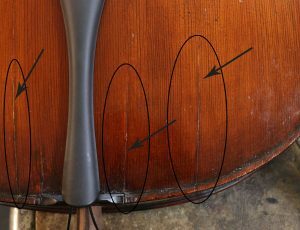 I have found that over many years of repairing instruments, too many instruments have been severely damaged by humidifying devices that leak within the instrument. Virtually all good instruments are glued together with water soluble glue or animal glues. When these glues are subjected to direct moisture (not humidification in a normal amount) they have a tendency to soften and no longer hold together with the original gluing strength. Secondly, the lower section of rib at the end block on the back table of the Bass when subjected to prolonged dripping from one of these devices can eventually unglue and warp. Consequently, a costly, extensive restoration can result. Another factor of humidification is that it works like a bathtub. In a bath tub, it doesn’t fill from one end to the top of the tub and over, but rather the entire tub must fill at the same rate. Humidity is like that as well. For one part of the room to have a consistent amount of humidity, perhaps fifty percent, the entire room must be that as well. The point is that for one of these internal humidifying devices (even if it was not a hazard to the structure of the Bass) to work efficiently, it would have to maintain the rooms overall humidity, which is not a possibility. In other words, whatever humidity is being emitted from one of these humidifying devices, most of that humidity is being absorbed by the environment of the room itself. Thus, a false sense of security exists that these devices are adequately protecting the Bass. Although a lot of players will go out and buy three or four of these devices, my advice to them is to first invest a few dollars in a hygrometer which will register the humidity percentage of the room. If the humidity is consistently below forty percent, invest in a reasonable humidifier. There are obviously no guarantees as to how an instrument will fair in a cold, winter environment, but a humidified environment will certainly give the Bass …old or new, a fighting chance not to have any serious problems! This winter, a number of damaged instruments occurred in University or College housing whereby, the bass is being kept in a storage locker with no possibility of overall humidification. I suggest a simple solution that must be approached with a good deal of responsibility. 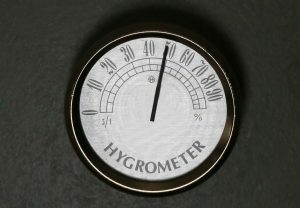 If room humidification can not be accomplished, I suggest the immediate use of a hygrometer to monitor the environment. If the situation causes the humidity level to be below the safe level of 50%, then the use of a fine atomizer spray bottle is a low cost, effective solution. One or two fine mist sprays within each F-hole, once or twice a day, will emit a good deal of humidity within the body chamber of the bass. The importance of responsible action is to avoid pooling or pudding of water within the body of the bass by overdoing this spraying. Such pooling can create the ungluing of component parts of the interior chamber. Proper misting which emits airborne moisture within the bass will temper the interior environment inside the bass and not create a damaging scenario. What is most important during these harsh months is the constant monitoring of the bass. Keeping the humidity level up is a good moisturizer for the bass and for you benefit. Enjoy Winter, Spring is on the way!